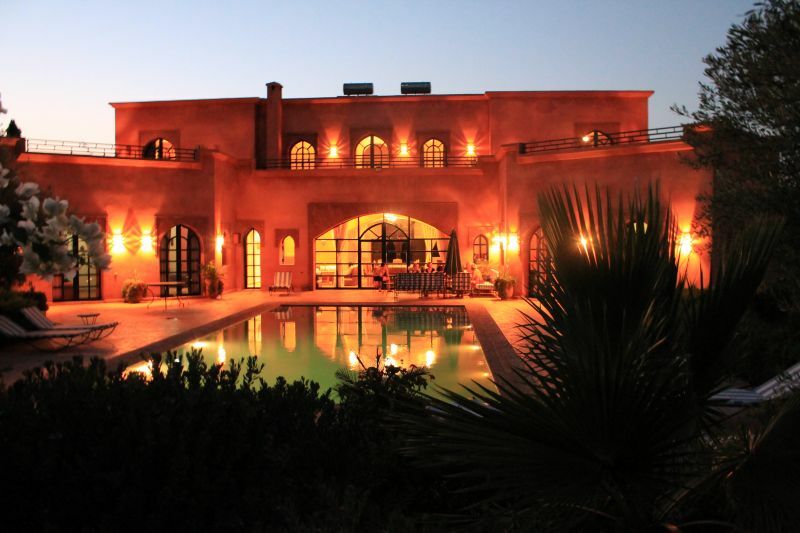 Magnificent Villa TY-COZ, close to Marrakech! exclusive with great comfort with its large 5 X 15 pool and enclosed grounds. RENTALS PER WEEK FROM ANY DAY,. Someone can welcome you at the airport and drive you to the villa. A cleaning lady will be on-site. We take care to find you cheap rental cars bargain and there is a bus about 900 m at the end of the road. In this little country paradise, you will have a wonderful holiday. We are at your disposal for all further information. 4-lane highway from Marrakech airport at 30 mm, bus 900 m, train-20 mm, bus station at 20 mm. 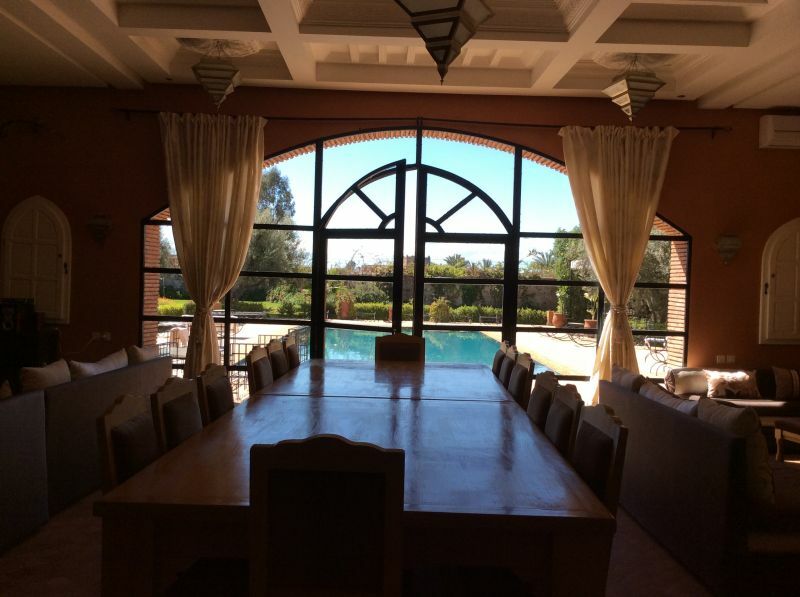 Thank you for your comments, which were welcome, the villa is located only 14 km from the city with a express road, the villa is nice to enjoy the quiet and nature, after sightseeing in the city of Marrakech. 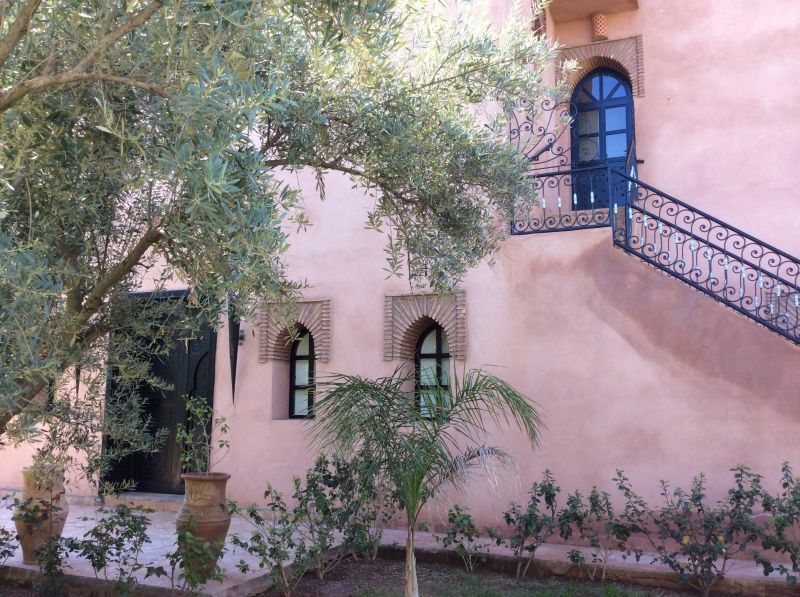 Merci pour votre commentaire, qui nous fait bien plaisir, la villa est située à seulement 14 km de la ville avec une voie express, la villa est agréable pour profiter du calme et de la nature, après les visites dans la ville de Marrakech. 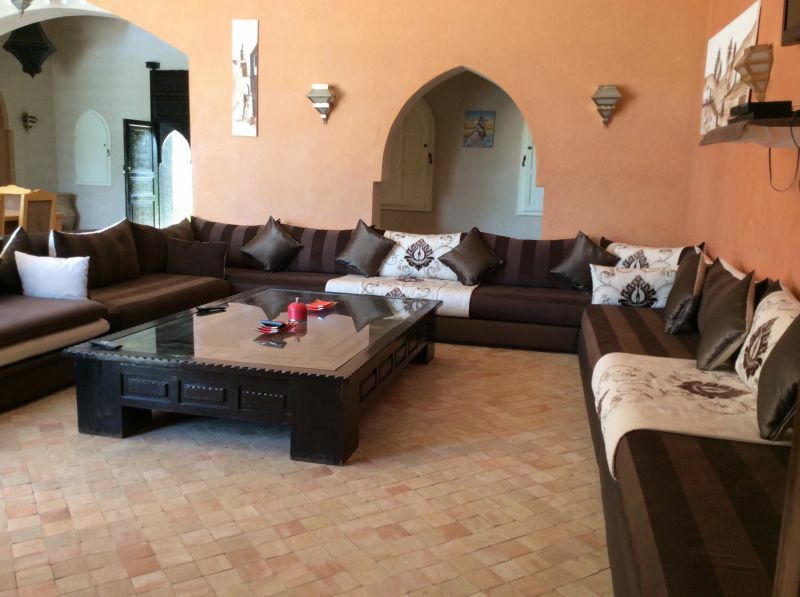 We had a perfect week in your house in Marrakech. We heard from Touria That we where the first Dutch family in villa Tycoz. So we made a commentery in English, So THAT other family in Holland can read it easily. On the Home Away site I try too well the commentary, but it did not work. With a Dutch family of 16 people, consisting of eight granddaughters aged 5 to 12 years and 8 adults, we have a week from 9 to May 16, 2015 stayed in villa Tycoz. By the benevolent caretaker Mr. Hamid from the airport met, where the owner Annemarie Mehat at our request 3 cars had rented. The house met all expectations that we had received in advance from the many photos and descriptions. On arrival there was an extensive delicious lunch ready for us, which was prepared by the cook Touria, her younger sister and the wife of Hamid. The three of them made us breakfast, lunch and dinner, at times we wished. Even when we came home later than planned was still served an excellent lunch or dinner. 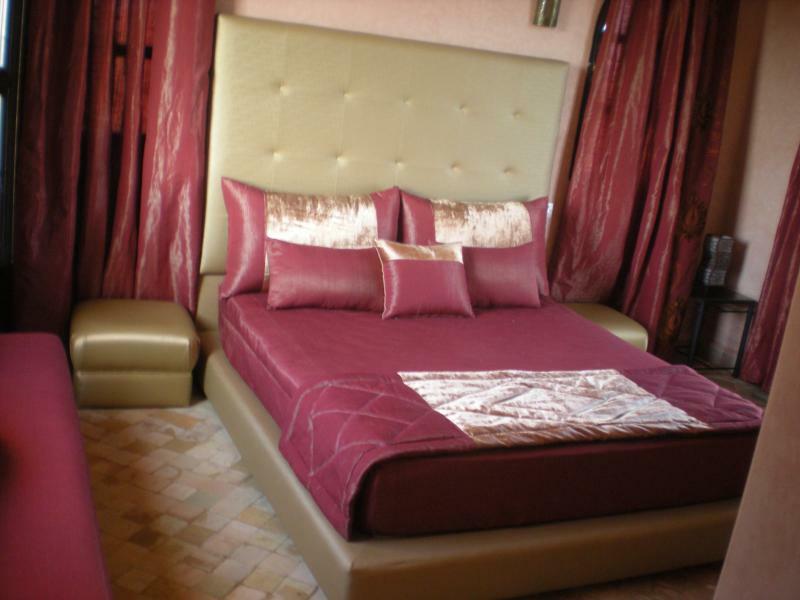 The house,bedrooms, bathrooms, the spacious garden, the sun loungers around the pool lovely, everything was super clean. 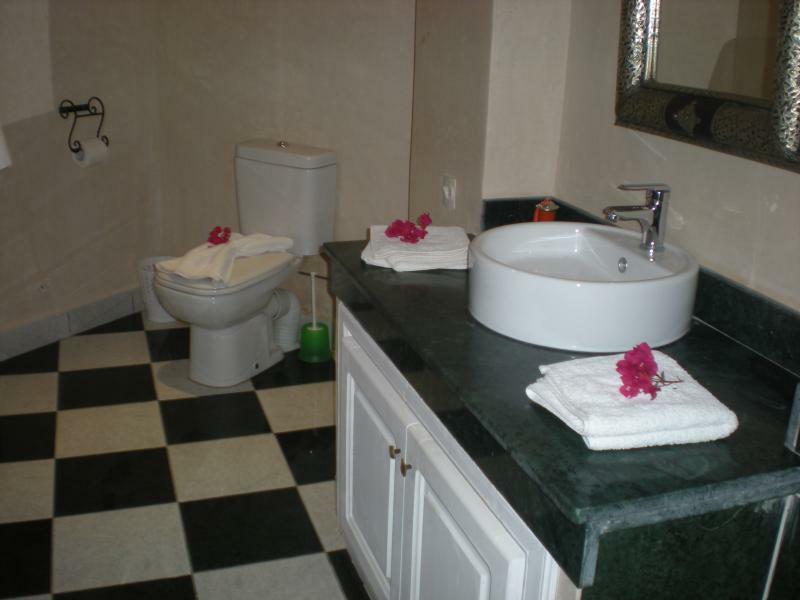 There were plenty of towels and bath towels provided which were changed regularly. The first day along with Hamid ? .40,00 for fruit and vegetable shopping done for the week, the market 800 meters back. Later bought from a wholesaler with Hamid and Touria for other food and alcoholic drinks. After we left daily Hamid doing some shopping for any meat we wanted. The temperature was exceptionally high for the time of year, but the pool gave a lot of coolness. A few large umbrellas plus standers places were missed. Hamid solved this problem by a large parasol to tie up one of the benches. Of course we have our cars drove several times to the city of Marrakech (25 minutes) and have us there marveled at the Moroccan culture. We are also the Atlas Mountains and drove there have hiked up to 3000 m. Altitude. The beautiful fertile green valleys were a feast for the eyes. Granddaughters have at a nearby riding school horse riding. Conclusion: BeautifulVilla, spacious bedroom bathroom, friendly manager, clean and hygienic (occasional cockroach, but you have in tropical countries), excellent cook Touria very friendly, helpful manager Hamid. Definitely recommended. What to say about the house? She just made us want to retire and not return to France. 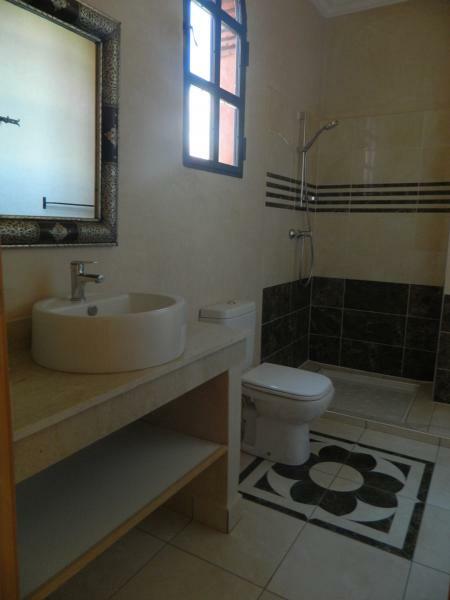 Spacious, quiet and nice, not very far from the center of Marrakech, the only problem is the access to the floor from the outside. The keeper Hamid has Morocco in his pocket. The staff is helpful and smiling, cook regaled us. We had a lovely time, the kids were in heaven, they will remember the great advantage of that pool of Marrakech. Bonjour, Quoi dire sur la maison? Tout simplement qu'elle nous a donné envie de prendre notre retraite et de ne plus rentrer en France. 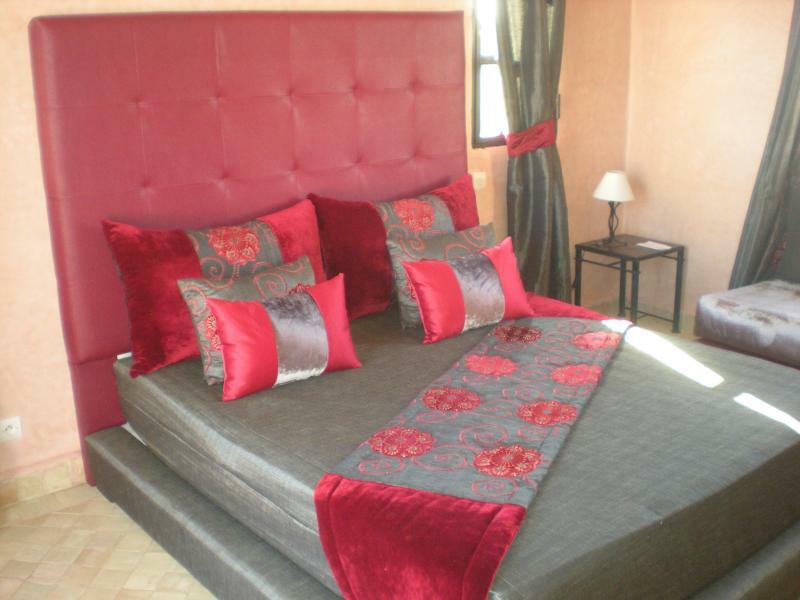 Spacieuse, calme et agréable, pas tres loin du centre de Marrakech, le seul hic est l'accès à l'étage par l'exterieur. Le gardien Hamid détient le Maroc au fond de sa poche. Le personnel est serviable et souriant, la cuisinière nous a règalé. 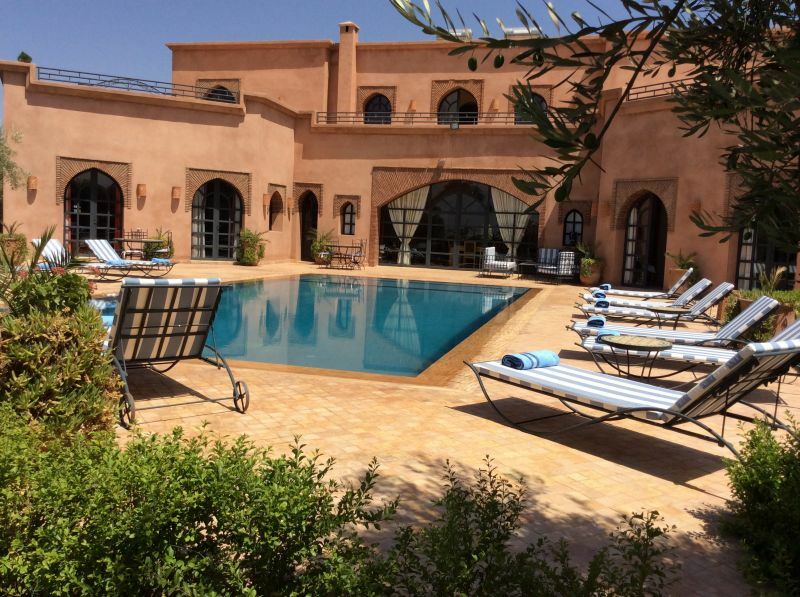 Nous avons passé d'agréables vacances, les enfants étaient au paradis, ils se souviendront d'avantage de la superbe piscine que de Marrakech. 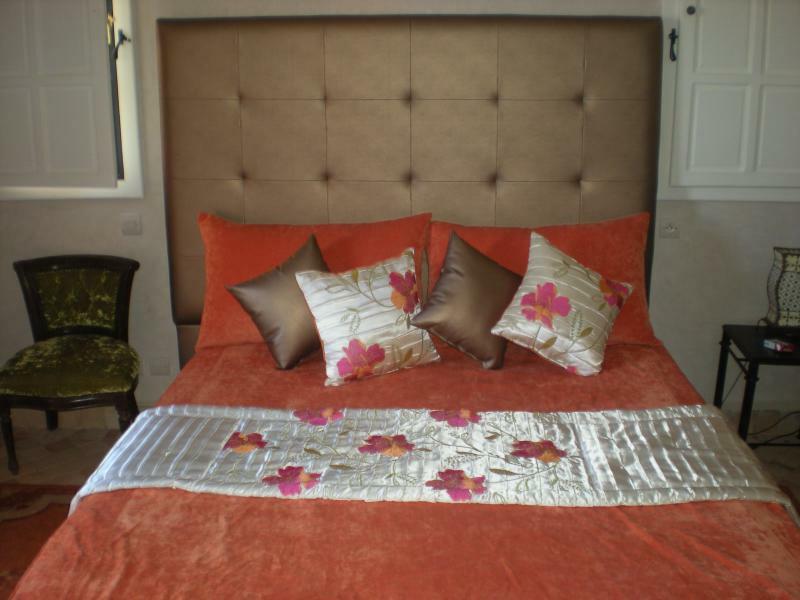 the service of the caretaker and the cleaning lady for €15 per day for 8 people and €25 per day for 9 to 16 persons.